September 2011 – Go. Find. Some random thoughts before I head into the weekend and off to Ohio for participation in a Warrior Dash. * This whole Warrior Dash nonsense was my youngest sister’s idea. M called up E (middle sister) and me back in February with this great idea that the three of us jump through fire, cross muddy streams and run a 5K. Won’t that be fun, she says. Sure, we say. We pay our entry fees. Like two weeks later she calls us back. Hey, remember that part about the three of us, oh, well, oops. I’m preggers. So M and her seven-month pregnant self will be taking pictures and holding our car keys while E and I dash. I think she did it on purpose. *This morning on the socialist, liberal elite-communist-loving NPR (to which I listen religiously), I had some little 9/11 moments while I woke up. I am not sure I am going to make it through the weekend without going on a crying jag about this. (I don’t think that would be a bad thing). I have heard lots of stories about Fr. 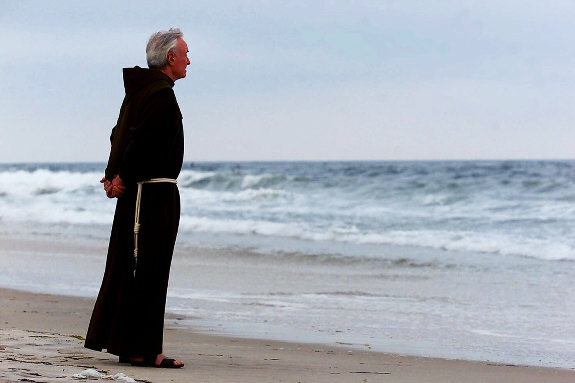 Mychal Judge, the fantastic Franciscan who went to the Towers to aid the dying. He became casualty #1 –the first one identified. The more I hear, the more I am sure I should ask Fr. Mychal to pray for us all, especially this weekend. Memory Eternal, Father. *Speaking again of 9/11, I can get behind the stair climbs as appropriate memorials to the victims. I saw my first stair climb this spring at a massive firefighter conference in downtown Indianapolis. I stood with the boyfriend next to a football field full of firetrucks while his colleagues from all over the world, some wearing turnout gear, climbed up and down the steps in Lucas Oil Stadium. A pipe and drum corps played Amazing Grace and I wiped tears from my eyes. I say this a lot when I write about Orthodoxy. We are physical creatures, more than just our minds. We love with our bodies, we (should) worship appropriately with our bodies and we should mourn with our bodies as well. The stair climbs are concrete ways to enter into the grief and horror of that day. It allows us to participate in a concrete way with the loss and work of others. It doesn’t change anything, but what a tribute of respect. Maybe I’ll do a civilian one someday. *One more thing, on a lighter note. I forgot to tell you that one of the highlights of Crabfest 2011 was when we set up my mom’s Christmas tree in her living room, lit, at 1 a.m. and in complete silence. GOOD TIMES. OK, so I swore I wasn’t going to get sucked into 9/11 again this year. I know, 10 years and all that. I’m a member of the media, right, so we love a good anniversary. But this is different, isn’t it? This was the live action, in-living-color-murder of 3,000 children of God — Sons of Adam and Daughters of Eve, gone in minutes. It made me sad. It still makes me sad. And now, having just picked at the scab via the NY Times extraordinary presentation of audio tapes gathered that day, I am thinking the next few days will bring the exact opposite behavior of what I had intended. I’m not going to go out and buy a 9/11 commemorative edition of People magazine. I’m not going to watch the specials on TV, or whatever. But I am going to go to church on 9/11. I will light a candle in the entrance and in the nave for those who died. I will pray. And I will mourn. And I’ll probably be blogging a bit about it, too. I’m sorry in advance. Last year we had our first Crabfest, under the light of the silvery moon (my grandma wrote new lyrics to that song for the party, I kid not) and the paw-paw tree. We tried to get back there this year, but like a heroin addict chasing that first high, we couldn’t quite recapture the magic of that first shipment of steamed Maryland blue crabs, the corn rolled in melting butter and Old Bay Seasoning getting in the cuts and nicks on our hands caused by the crab shells. This year, we had thunderstorms, an unbelievably bad Notre Dame football game, an ailing dog, and way more beer than we could drink with Uncle Scott in Krgyzystan. The party was totally different, equally enjoyable, but just not as mystical as that first one. This one involved a 3-year-old. Every party should involve a 3-year-old. Upon his arrival in the house, he told my mother, whom he calls Um-Mum (long story), to take a deep breath. If you know my mother, and you know how completely crazy she can be when left unattended, you know this is a PERFECT singular piece of advice. L (the 3-year-old): (finger pointing) No, you do not. They are in my private parts. L: I don’t like it, Mommy, it’s soggy. Mommy: What does soggy mean? If you want to make an argument, you have to know what the words mean. L: Daddy, what does soggy mean? Mommy: No, you have to know what it means? Mommy: Then you can’t not like it because you don’t know what it means. L: I think Daddy’s going to the store to pick up my new cousin. Me: Your new cousin? Who is your new cousin? L: His name is Julio. Me: It is? What does Julio look like? L: He looks like an elephant. Me: What does Julio look like? L: Julio looks like a long-necked giraffe. The 3-year-old prayed to bless the meal Saturday night, his hands kinda covering his eyes and his voice barely above a whisper with a huge grin on his face. Author RebeccaPosted on September 5, 2011 September 6, 2011 Categories random stuff, Ridiculous (turtles)Tags life, peaceandquietLeave a comment on So long, Crabfest 2011!